Just 27 years ago, the only places Connecticut residents saw turkeys were in the supermarket and on their holiday tables. Now, thanks to a reintroduction program by the Connecticut Department of Environmental Protection, wild turkeys are again a common site in Barkhamsted. 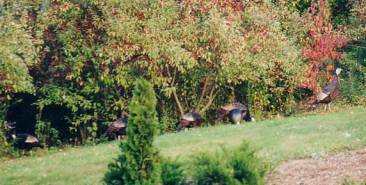 In fact, the folks who live on East River Road in Riverton see them waltzing across their yards nearly every day! Though wild turkeys prospered in this part of the continent for many years, the European settlers had a devastating effect on their population. By 1812, deforestation and unrestrained hunting had completely eradicated wild turkeys from Connecticut. The turkey was absent from this state for one hundred and sixty-three years. During that period, however, the practices that had wiped the bird out slowly faded away. Our reliance on farming and logging lessened and the forests came back. The advent of modern food production and distribution methods also substantially decreased the amount of hunting. The climate was right once again for the wild turkey to survive in the state. In 1975, the Connecticut Department of Environmental Protection trapped 22 wild turkeys in New York state and released them in northwestern Connecticut. Over the next seventeen years, the DEP's Wildlife Division captured some of the turkeys and relocated them throughout the state. This spring, the state s wild turkey population was estimated at approximately 30,000 birds, spread throughout the entire state. With such a successful resurgence of the population, the State began allowing turkey hunting in 1981. Turkeys may now be hunted in spring and fall seasons. 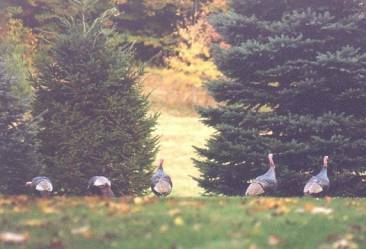 In the spring 2000 season, 7,000 hunters took 2,040 turkeys. Connecticut's restoration efforts have been so successful that we now supply birds to other states' restoration programs. 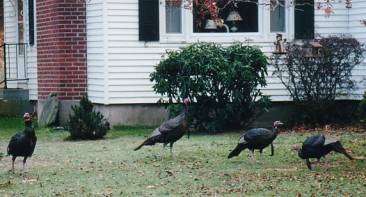 Between 1987 and 1997, Connecticut provided 188 turkeys to states such as Maine, Louisiana, North Carolina, and Texas. Aside from the yards of Riverton, turkeys are found in both forests and fields. Adults weigh anywhere from eight to twenty-five pounds and are approximately thirty-six to forty-eight inches long. They feed primarily on acorns and similar fruits and seeds as well as insects. Turkeys are easily recognizable by their size and coloration. They stand hip-high and are an iridescent brown. Their bald heads and necks are red, white, and blue (they are brighter during the March/April mating season). Though most often found foraging for food on the ground, turkeys can fly (contrary to the popular myth that was widely propagated in an episode of the television program WKRP in Cincinnati in which a character states "As God as my witness, I thought turkeys could fly."). In late summer, turkeys begin to bunch up into flocks that normally number between 10 and 20 birds. 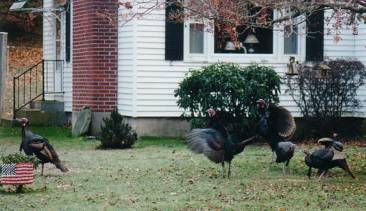 Although turkeys have become commonplace in Barkhamsted, the DEP urges residents not to feed the wild birds. Turkey Program Biologist Michael Gregonis states "When turkeys or deer are concentrated due to an artificial source, infectious diseases may be passed from one individual to another, resulting in a disease outbreak." In addition, turkeys that are often near people due to feeding may become aggressive toward humans, especially during mating season. Connecticut's winters are not severe enough to cause starvation of turkeys, who are well adapted to our climate.